Autumn Term 2014 has proved an exciting time for TechSoft to be working with teachers at the sharp end of change. The work needed to implement changes for the new National Curriculum D&T Framework is well underway, and demand for training has seldom been stronger. So what challenges do we see teachers facing and how can TechSoft help? This means that action (eg., making a prototype) leads to evaluative thinking and this determines what needs to be done next. Fitting this more open-ended approach into a regulated timetable slot needs smart tools and careful planning if it is to conclude with a high quality product. Quick card and tape mock-ups have their place but sometimes accuracy is needed to test an idea. 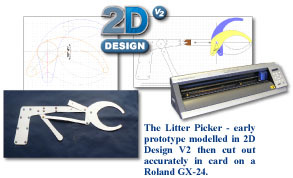 Here is an example of a litter-picker project I developed – the detailed design work was all completed in 2D Design and SolidWorks, and early prototypes were cut from the CAD drawings using inexpensive card and a Roland GX-24 knife cutter. The card models were assembled with paper fasteners and provided all the accuracy needed to test the idea and develop the design further. CAD files can provide plenty of evidence for assessment and CAD is an extremely efficient way to refresh an idea to provide the next iteration. And, of course, it’s quick and virtually cost-free to do. 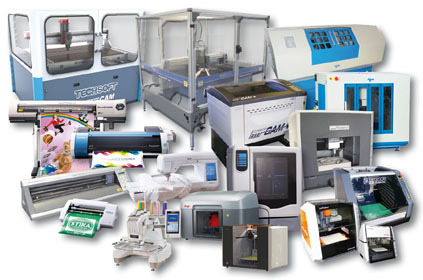 At TechSoft, we work hard to make sure that all our CAD/CAM resources work together to give you the tools you need when you need them. The new framework requires students to use a range of computer-based tools including CAD and CAM, and there is an emphasis on students selecting techniques according to the task in hand. In the litter-picker example, design work was carried out in both 2D Design and SolidWorks. To create the claw shapes, 2D Design was appropriate because files could be output direct to a Roland GX-24 for knife-cutting accurate card models. The same files could have been output just as easily to any 2D capable CAM device including a TechSoft LaserCAM, any of our CNC milling options or even a TechSoft PlasmaCUT if parts were needed in steel. 2D files were also saved in .dxf format to be imported into SolidWorks for 3D treatment. This enabled testing (more computer-based tools) and provided 3D format .stl files for 3D output. This could include 3D Printing. One of our Stratasys machines would be ideal to generate solid ABS parts with the strength and accuracy needed for a fully functional working prototype. 3D machining is another good option so, if the handle needed a bit of ergonomic attention, parts could be enhanced in SolidWorks to give a more sculptural effect and then machined from hard timber or modelling material using any of our CNC milling machines. These start with the brand-new Roland SRM-20E and include the ever popular MDX-40AE and the MDX-540E for the ultimate in speed and refinement. What tool is the right one will not just be about the demands of the project – 20 students all needing to machine 3D models the same day (let alone the same lesson) will simply not work. TechSoft CAD/CAM resources are designed to work together so teachers and students will have the agility needed to keep project work on-track and make decisions that suit classroom logistics and project demands. Here another requirement for D & T comes to the fore: ‘pupils’ learning within Design, Make, Evaluate and Technical Knowledge should be developed as a connected, coherent whole’ so these aspects will be found within the students iterative approach – not a new section in a design portfolio. The litter picker concept can learn much by mimicking how the animal kingdom uses beaks, claws, fingers and toes to pick, peck, grasp and manipulate food. And if design work has been completed in SolidWorks – then why wouldn’t you use computer-based tools to analyse ideas? In this example I used simple animation in SolidWorks to check the action and capacity of the jaws to make sure it could meet the brief and pick anything from a drinks can to a sweet paper. Individual parts were then subjected to a strength test using SolidWorks Simulation. Simulation is, in effect, wizard-based so it’s quite easy to make judgements about where opposing forces will be in the part. The results show where there are ‘hot spots’ and where changes in materials or shape could strengthen things. With a good grasp of SolidWorks and 2D Design, none of these things are particularly hard to do and that is perfectly OK. D & T is not about rewarding the use of complex techniques for their own sake but how a range of traditional and modern techniques have been used to progress the design of an elegant, effective product. It should all feel quite natural and unforced. Not surprisingly, this academic year has been particularly busy for our CAD/CAM courses. We offer a range of scheduled and bespoke training options and all are aimed at helping teachers use CAD/CAM as a smart tool for students.